Ah Christmas! Ahhh paper crafting! I don't know about you, but I have a few projects in the works at the moment and ideas for more are skittering around in my head. No doubt time will run out before I get to all of them, but just in case you're looking for something new to make, perhaps one or more of these pretties will catch your eye. 1. Tiered Garland Ornament - this is a sample project from All Things Paper - the book, as shared on Kollabora. Designed by Patricia Zapata, I love the way it looks like an edgy, abstract pine cone. By the way, Patricia just won the national 2013 Scotch Brand Most Gifted Wrapper Contest in New York City this past Friday. Her uncluttered style has always wowed me and apparently it was the same with the judges. Congratulations Patricia! 2. 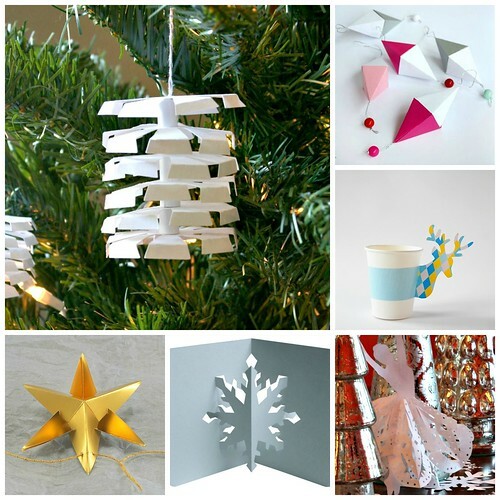 Paper Diamonds - Geometrics are everywhere, so why not hang some on your tree? The Swedish blog Pysselbolaget shows how to make these super-stylish gems. 3. Winter Animal Cup Cozies - So darn cute! Victoria of A Subtle Revelry shared four animals that were designed and photographed by Sibylle of Funkytime. 4. Snowflake Ballerina - Lea of Heart Stone Paper shares cut paper snowflakes (actually, she uses stone paper!) and uses them to dress up paper doll ballerinas, an idea from Tanya Ahmed as shown on Krokotak. 5. Pop Up Snowflake Card - Elod Beregszaszi of Popupology explains how to make this pretty cut paper card and also a similarly shaped cut paper tree ornament. We are honored to be included in this fab round-up! Many thanks from Sweden! You're very welcome, Karin - thanks for sharing such pretty ornaments! Love the star garland. Thanks for the links Ann. I admire and appreciate all the inspiration you create and share!